The G02 Carshare will launch in April 2010. However, before our official launch, interested individuals can check things out by booking the Prius on a trial basis to see how it works. Whether you need wheels for a couple of hours or a couple of days, booking the carshare’s Toyota Prius will give you a feel for how the carshare works, and allow you to benefit from the low hourly and mileage rates without the commitment of membership. Call Kim at (250) 877-6030 to find out more. Environmental: The vehicles in the carshare will be low-emission and their emissions will be countered through the purchase of carbon offsets. Transportation accounts for 60% of the greenhouse gas (GHG) emissions in the Bulkley Valley, so joining the cooperative is an effective way for residents to reduce their transportation-related GHG gas emissions. 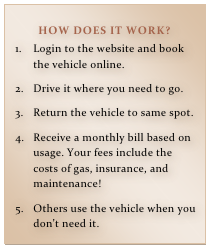 Financial: By cooperatively owning a vehicle, members have the convenience of using a vehicle without the associated costs of maintenance, repairs, insurance and fuel. According to the CAA’s 2009 Driving Costs brochure, Canadians who drive 18,000 kms a year spend an average of $9,800 on the ownership and operating costs of their vehicles. As a car share member, you could pay one-fifth to one-tenth of that figure! You may be able to save thousands of dollars every year by belonging to the car share. If you are interested in joining, either as a member or a board member, please call Kim Struthers, One Sky, at (250) 877-6030 or .